A one-day competition in which students play the role of VCs and real startup pitch for funding. VCIC is a great place to network and learn about entrepreneurship and venture capital. VCIC is a great place to meet VCs and practice your pitch. What it’s like for startups. Network with other VCs and get a sneak peak at some early stage startups. What it’s like for VCs. VCIC is a competition in which students play the role of investors and real startups pitch to them. Most MBA events take place on a Friday, all day. Most undergraduate events are on Saturdays. Teams must be 5 students with one optional student observer and one optional staff or faculty advisor. The registration fees are different for different regions. In North America, it is $500 per team. Price money at regional finals is $1000 for 1st place, and the top team is invited to global finals in Chapel Hill. Prize money at MBA Global Finals is $5000 for 1st and $2500 for 2nd. Prize money at Undergraduate National Finals is $2000 for 1st and $1000 for 2nd. The event is by invitation only. Your school must be invited. If your school is not on a bracket, fill out the form on the right. 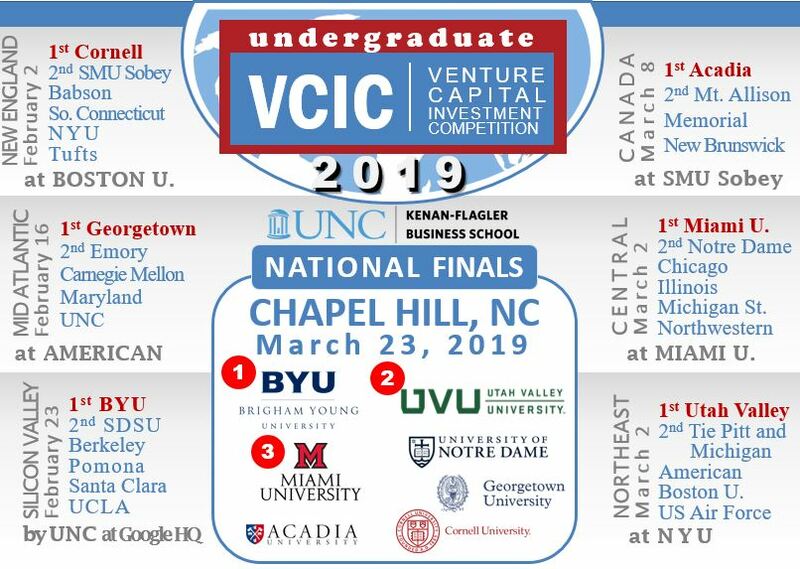 If your school is already on a bracket, you need to find your VCIC advisor or student organization in charge of selecting the VCIC team from that school. Search the VCIC site for your school’s participants. How many students are on a team? Each team is required to be five students with one optional observer. Teams may also be accompanied by a staff or faculty advisor. 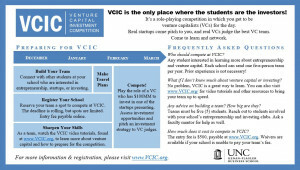 How is VCIC different from a business plan or pitch competition ? At VCIC, students are the investors, not the entrepreneurs. Students do not come with startup ideas. Rather, students play the role of analysts in a VC firm assessing the startups at VCIC as potential investments. Real investors are at the event assessing the students’ ability to be the best VCs based on these judging criteria. In North America, there is a $500 entry fee for each team paid by your school. This fee can sometimes be waived for new schools. Email vcic@unc.edu if you would like to apply for a waiver. This fee covers all VCIC activities for this year. If you win your region, for example, there is no extra fee to compete at the global finals. What if our school does not have a VC class, and we don’t know much about venture capital? You will learn a ton preparing for and participating in VCIC! It is primarily an educational event, and if you don’t have other ways to learn about venture capital at your school, you are encouraged to take advantage of this resource. That said, it is also a competition, and the deck is stacked against a team that has no support from its school. Your team still has a chance to win if you work really hard on your own. See the VCIC training videos and consider purchasing Patrick Vernon’s Venture Capital Strategy (free samples here). Brad Feld and Jason Mendelson’s Venture Deals is also very helpful for understanding term sheets. Your school not on a bracket? Please tell us anything we should know about your interest in competing in VCIC, e.g., existence of student club, support from faculty, financial support from school, etc.